One of America’s finest artists, Richard Diebenkorn, marched to his own drummer. A large, shy man, he found his own way through the trends of the ‘40s, ‘50s and ‘60s and created unique, vibrant abstract landscapes, known as The Ocean Park Paintings. Diebenkorn was born in Portland, Oregon in 1922. His father, the vice president of a hotel supply company, moved the family to San Francisco when Diebenkorn was two years old. I want a painting to be difficult to do. The more obstacles, obstructions, problems – if they don’t overwhelm – the better. I would like to feel that I am involved at any stage of the painting with all its moments, not just this ‘now’ moment where a superficial grace is so available. As a child, Diebenkorn was enthralled with the illustrations of Howard Pyle and N.C. Wyeth, which he saw in books given to him by his maternal grandmother, Florence Stephens. He drew his own illustrations on the pieces of cardboard that came tucked inside his father’s freshly pressed shirts from the dry cleaners. Florence Stephens was an extraordinary woman. She was a published short story writer, a poet, watercolor painter and got a law degree in her late 40s. During World War l, she successfully defended dozens of German-Americans whose rights had been violated. It was Stephens who took Diebenkorn to museums and galleries and exposed him to fine art. In 1940, Diebenkorn went to Stanford University, where he began his traditional art training. It was at Stanford that Diebenkorn met his first mentors, Victor Arnautoff, who began his classical art studies, and Daniel Mendelowitz, who introduced him to the works of other artists, including Edward Hopper. World War II interrupted Diebenkorn’s studies at Stanford, but led him to the discovery of the works of Matisse while stationed, as a Marine, at the base in Quantico, VA, where he was able to visit the Philips Collection in Washington, DC. Diebenkorn met his wife, Phyllis, at Stanford. The couple moved many times, with their two children, during the first ten years of their marriage. 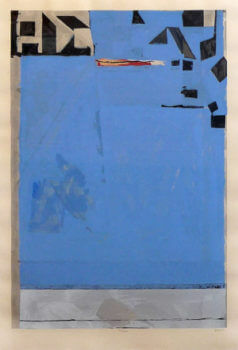 Diebenkorn painted and taught at the California School of Fine Art, then finished a Graduate of Fine Arts program, under the GI Bill, at the University of New Mexico in 1952. When he moved to Berkeley in 1955, Diebenkorn became part of the Bay Area Figurative Movement. In 1966, Diebenkorn moved to Los Angeles, where he taught at UCLA. The view from his Ocean Park studio inspired him to paint a series over over 140 Ocean Park Paintings, the works for which he is most well known and most coveted by collectors. The Ocean Park Paintings were done on large canvasses, with vibrant colors. Like Matisse, Diebenkorn left changes and corrections in his works, allowing the viewer to see some of his process. Diebenkorn’s works include, not only paintings, but drawings, woodcuts and prints. Diebenkorn died in 1933, at age 70. His works are included in the permanent collections of the Guggenheim, the Hirschhorn, the Whitney and other museums and galleries around the world. Please contact us for more information about the Richard Diebenkorn works for sale at Vertu.